In this May 8, 2018 photo, former Massey Energy CEO Don Blankenship speaks to supporters in Charleston, W.Va. 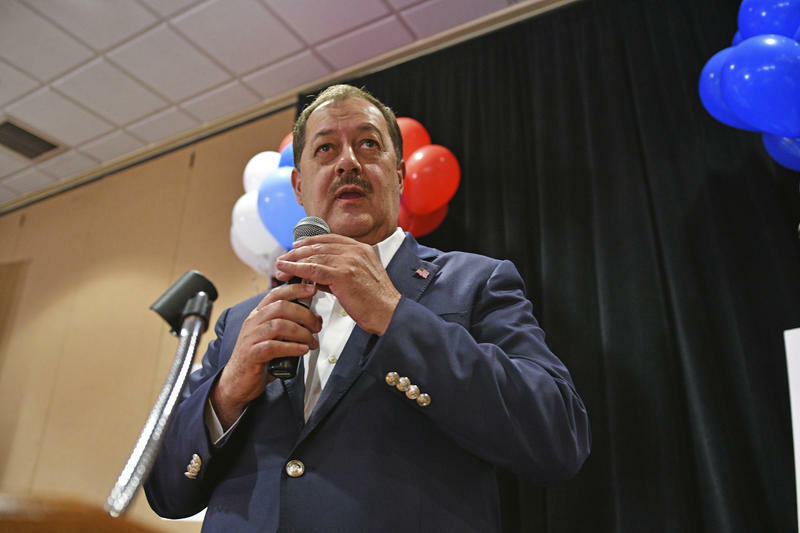 Despite having lost the Republican primary, convicted Blankenship said he’s going to continue his bid for U.S. Senate as a third-party candidate. West Virginia has a sore loser law that prevents candidates who lost a primary election from taking advantage of later filing deadlines to run on a third-party ticket. "The political establishment cannot retroactively enact laws that prohibit individuals who become members of some political parties from being on the ballot while allowing individuals who become members of other political parties to be on the ballot," the campagin said in a statement posted to Facebook. "This is what the Communist or Nazi party would do and is a perfect example of political party behavior that violates an American's guaranteed right to equal opportunity. It is a clearly discriminatory law and exactly what George Washington warned of in his farewell address," the statement continued. The former Massey Energy executive will file paperwork Tuesday at 1:30 p.m. at the West Virginia Secretary of State's office at the state Capitol in Charleston. Blankenship spent a year in prison for willfully conspiring to violate federal mine safety standards -- a misdemeanor -- following an explosion that killed 29 men in April 2010. His one-year term of supervised released ended a day after West Virginia’s May 8 primary. He drew criticism during his primary campaign for racially-charged ads that targeted Senate Majority Leader Mitch McConnell, some of which referred to McConnell as "Cocaine Mitch." A day before the election, President Donald Trump urged voters to reject Blankenship -- in lieu of an outright endorsement of either West Virginia Attorney General Patrick Morrisey or Congressman Evan Jenkins. Blankenship lost the GOP nomination to Morrisey, who is aiming to unseat Democratic incumbent Joe Manchin.